Fancy a change of scene? How about a road trip to visit to one of the great Georgian Spa Towns? Harrogate in Yorkshire is an incredibly pretty town, with lots of traditional buildings, wide streets and plenty of choice as far as entertainment goes – see what’s on the local listings, and you’ll have plenty to do and see, day and night. If you are game for a new experience, you might want to sample the delights of the strongest sulphur wells in the UK, and possibly Western Europe (!) in the Royal Pump Room Museum – full of weird and wonderful items from Harrogate’s past and old film footage of the Spa Town when the wealthy flocked to take the water. For those who enjoy park life, a visit to Harlow Carr Gardens will be a winner. These Gardens were previously known as The Bog Fields and this is where Victorians originally came to sample the sulphurous waters. Mineral springs were unusually prevalent in the gardens - 36 wells were found in the grounds of the 17 acre garden, and all the wells had different properties! The Pump Rooms were gradually constructed around these wells, offering visitors the opportunity to undergo the rigours of various treatments. For something a little more modern, you could visit the newly refurbished Turkish Bath Spa for a full spa experience. You can try out a warm, hot and cold plunge pool - great for the skin but be prepared for the shock – it is very cold. If you enjoy walking, take a visit to How Stean Gorge. There are paths winding along this deep ravine, set in a lime stone gorge. It’s a great place to visit when the rains have been heavy since there’s some serious white water to be enjoyed here. 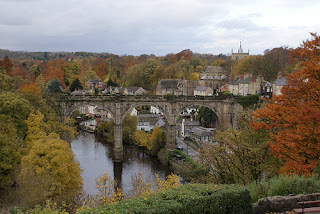 Another place to see is Knaresborough Castle – children love it, since there are lots of places to explore, including the Courthouse Museum and Dungeons – very atmospheric! Harrogate has a link to Agatha Christie – the author took flight from her home after the death of her mother and marital problems – and under a false name, stayed in the Old Swan Hotel. She made full use of her time incognito and her foray into freedom was only halted when she was recognised by a band musician. If you are going to be taking off into the wild blue yonder, check your vehicle is up to the trip, because you might well want to go further afield. Harrogate is close to Skipton – a market town, Thirsk and Ripon – known for its Cathedral. 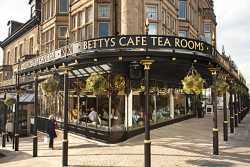 You could also go off road and visit the North Yorkshire Moors, so check your car breakdown cover is up to date before you set off in time to enjoy afternoon tea at Bettys' Café and Tea Rooms – one of the best in the North!